A participant assessed a volunteer posing as a survivor injured in a tornado during a disaster training exercise organized by Wright State’s National Disaster Health Consortium at the National Center for Medical Readiness at Calamityville. Trapped in a car demolished by a tornado, an injured woman screams for help for her unresponsive sister. A team of nurses uses a long steel pole to leverage a telephone pole off a victim, while others triage several wounded survivors, applying tourniquets and dressing injuries. With no gurney available, they strap a survivor to a door and carry her to a staging area where her injuries will be further assessed. Another group attempts to load a mannequin in a helicopter, but are told the weather is too severe to take off safely. They regroup and carry the mannequin to a waiting van instead. 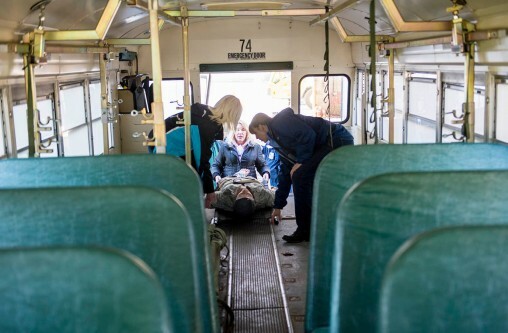 These were scenes on the final day of a weeklong training program offered by Wright State University’s National Disaster Health Consortium (NDHC), an interprofessional program designed to standardize disaster preparedness, response and recovery training. 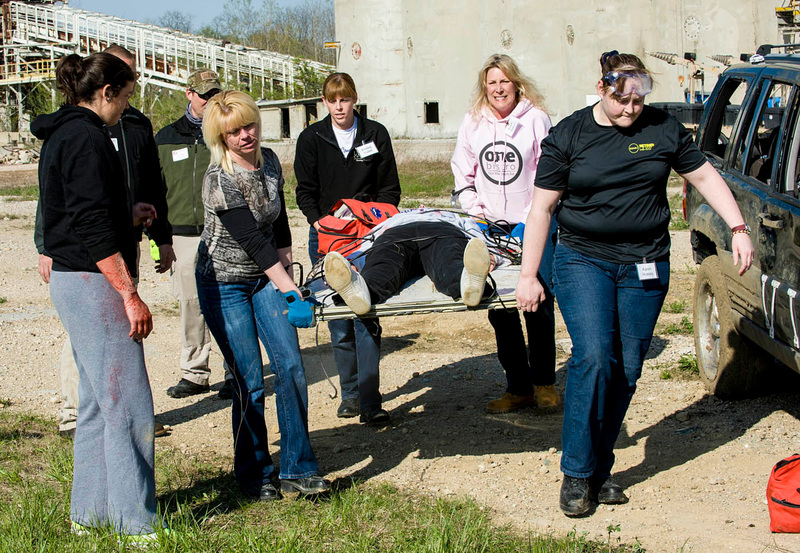 Thirty-eight people participated in the training, which took place May 18-22 at Wright State’s National Center for Medical Readiness at Calamityville. It was the third live training exercise organized by NDHC this spring. NDHC is designed for civilian and military health care professionals, including nurses, physicians, police officers, EMTs and firefighters. It is presented by the Wright State College of Nursing and Health in collaboration with the National Center for Medical Readiness (NCMR). 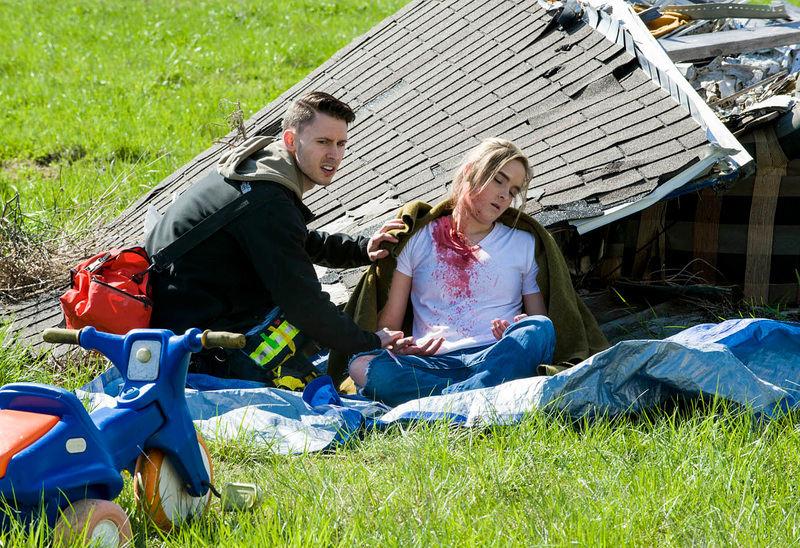 With no gurney available, participants practiced strapping a survivor to a door and carrying her to a staging area where her injuries were assessed. NDHC was created to help meet the goal of Homeland Security Presidential Directive 21, which called for the creation of a common body of knowledge about disaster preparedness and training. The directive’s goal is to allow “disasters workers — whether they come from civilian, military, wherever — to work together,” said Dan Kirkpatrick, NDHC co-director and a clinical instructor in the College of Nursing and Health. History shows that the United State must be better prepared for disaster response and recovery, said Sherry Farra, Ph.D., NDHC co-director and assistant professor of nursing. “That’s our goal: to help people work together to have the best response possible in the event of a disaster. And unfortunately that’s not always been well done,” she said. NDHC includes in-person training over five intensive days at Calamityville, a 52-acre disaster training zone featuring concrete passageway-filled buildings, silos, tunnels, ponds, cliffs and wooded areas. Participants learn the latest techniques in first aid, how to extricate someone from a car or collapsed building and how to load someone into a helicopter and a vehicle. Many of the updated first aid techniques — including applying tourniquets and treating burns — were learned during the wars in Iraq and Afghanistan, Kirkpatrick said. He emphasized that nursing and medical students do not receive first aid training while in school. And most practicing nurses and doctors are accustomed to working in sterile environments with readily available medical supplies. But that won’t always be the case in an emergency. So NDHC participants learn how to clean and dress wounds without tape and gauze and what they should keep in a first aid kit. One of NDHC’s important lessons is how to provide shelter during a disaster, Farra said. “We train the participants on how to be a shelter worker, how to assess survivors, how to identify people that have special needs within the shelter. It’s really a critical part,” she said. 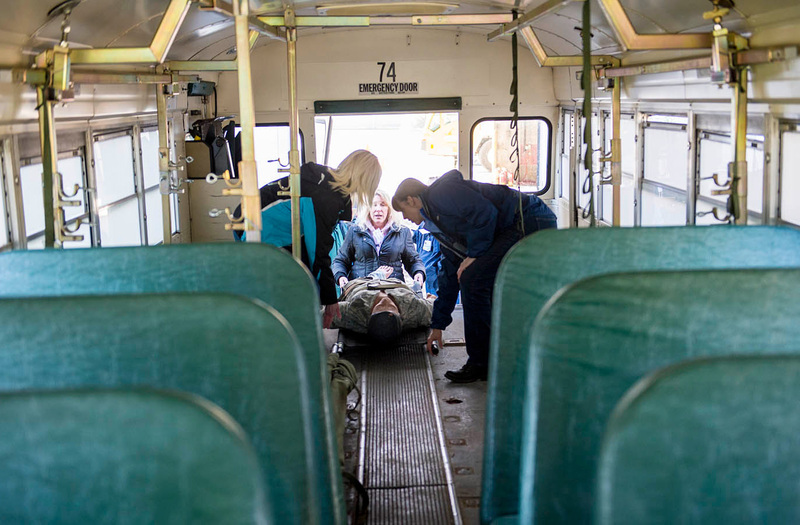 Participants practiced loading a mannequin into converted school bus designed to carry patients. The program also covers proper ways to communicate over handheld radios and how to communicate and disperse assistance by training in NCMR’s state-of-the-art emergency operations center. In addition, participants traveled to the Dayton VA Medical Center to learn how to evacuate a hospital. Another session focuses on ethical issues in disasters. “We put students through a situation as a group, and they have to decide how they would handle an ethical situation during a disaster,” Kirkpatrick said. NDHC faculty includes NCMR staff, faculty from the College of Nursing and Health and Wright State’s Boonshoft School of Medicine, retired military personnel and personnel from the Wright-Patterson Air Force Base Medical Center. Prior to the live training exercises, participates take online courses covering topics like the history of disasters, emergency management for health care organizations and leadership during disasters. The program has attracted participants from around Ohio, New York, Kansas, Missouri, Florida, Maryland and Nebraska. Participants receive continuing education credit, a certificate from NDHC and Advanced Disaster Life Support certification. More information about the National Disaster Health Consortium, including registration details, is available at nursing.wright.edu/ or by calling (937) 775-3572.